Bayflower is the perfect size for a couple that want to run their own boat, but still have enough room to stay on board for extended periods of time. The open floor plan of the Salon and Pilothouse make her feel like a much larger vessel than her 57 feet.The full beam master stateroom is amidship whichis the quietest, most stable part of the boat. She is happy running for days at 8-10 knots or you can run her up to 17 knots when you want to get there fast.She is a very clean boat with low engine and generator hours. She is stabilized and carries 1,200 gallons of fuel making her a great boat for extended voyages. United Yacht Sales New Jersey would love to guide you through a personal showing of this 57' Marlow Me 57c 2003. 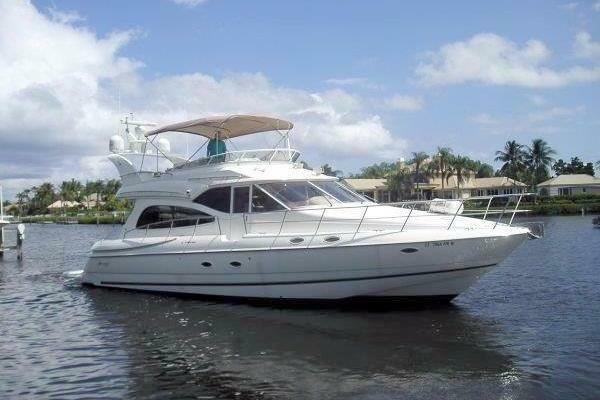 This yacht for sale is located in Unknown, Florida and priced at $1,050,000. For a showing please contact us by filling out the form on this page and we will get back to you shortly! The galley is 3 steps up from the forward end of the salon. The U-shaped counters are done in Black Galaxy Granite with beautiful teak fiddles. The Sub Zero drawers keep the galley more open so you can see into the salon. She has all the features of a great kitchen on land including aDacor smooth surface cooktop, convection / microwave oven, full size conventional oven, and a drawer style dishwasher. There are lots of drawers and cabinets for storage. For those that can get queasy at sea this galley up arrangement is much more comfortable because you can see the horizon while working in the galley. Her fullbimini softtop and side panels provide protection from the sun and/or inclement weather.The enclosure is very well done and many of the panels open for good ventilation. The Stidd helm seat is on the centerline and offers great visibility in all directions. The seating is arranged in two separate areas to port and starboard. There is plenty of space for 6-8 adults. As you use the yacht you will find that the visibility at the lower helm is excellent and there is no reason to be up here on a bad day. This is a great entertaining area as well with a drink refrigerator with ice maker, sink, and grill. Once the dinghy is in the water you have a nice sunny deck space as well. The davit is rated at 1,000 lbs. The engine room is very clean. The bilges are completely finished making them easy to keep clean. Even the engine beads are done in polished stainless steel. The space is air-conditioned and you have over 6’ of head room withgreat access to both engines and the generators. The fuel system is very simple and you normally configure it so the 2 tanks are valved together so you can fill the boat from either side as if it were one big tank. 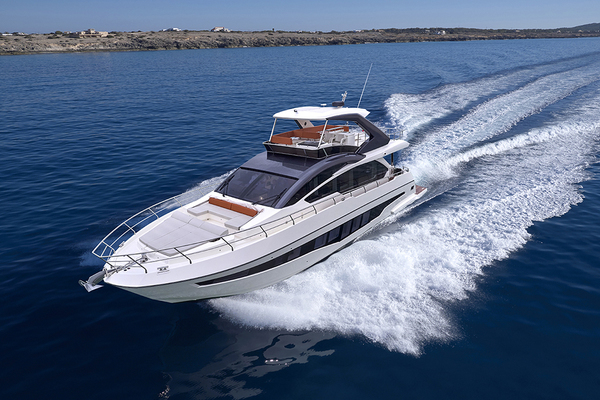 The drive system is fitted with Aquadrive units and special soft motor mounts providing a yacht that is much smoother and quieter underway than a traditional direct drive shaft system. There are 24V lights and bright 110V florescent fixtures over each engine. Above the watertight engine room door there is an engine room camera that can be displayed at either helm station.